From November 15, 2017 through December 24, 2017, get $25 off select $100 DeWalt orders from ACME Tools. Use promo code DEW2017. 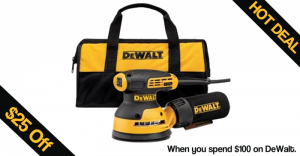 The deal is limited to select DeWalt products, but it looks like there is a good mix of popular power tools, cordless tools, as well as accessories. This deal is also available on DeWalt tools that are shipped and sold by Amazon (not a 3rd party seller). The discount automatically applied at checkout. We see similar deals like this throughout the year, but they usually only offer $20 off. This $25 off deals seems to be reserved for the Christmas season.